Utilize space and save money! The Twin Stacker can transport and stack two pallets at the same time and can operate in very confined areas, e.g. in lorries and shopping and storage areas. The Twin Stacker has small dimensions and is very maneuverable! By utilizing the space better in the lorries, the number of transport tours can be reduced. Low own weight means better utilization of the capacity of the truck tail-gate. A unique system (patented) “locks” mast and propulsion unit when lifting more than 900mm. 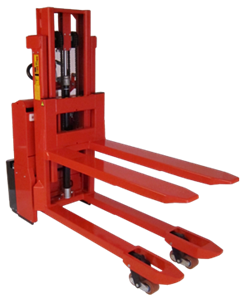 The stacker is fully stable and safe, also when lifting. The Twin Stacker is very maneuverable also on uneven floors. Twin Stacker has an elegant design with rounded corners and makes no damage to surroundings, pallets and goods. The design puts focus on the safety and ergonomic working conditions of the user. As an example the ergonomically correct handle ensures the user a relaxed hold.